Winemakers’ favorites: Seven Hills cabernet sauvignon, $30, and Charlotte’s Cuvee, $40. Best food match, red: Cellar Red or cabernet sauvignon with grilled or braised meats. Best food match, white: Kibitzer Riesling, $12, with grilled prawns or spicy Thai food. Grande Ronde Cellars began as a partnership between four men with the same love – for grapes from the Walla Walla valley. Dave Westfall, David Page, John Mueller and Michael Manz launched the winery in 1997 with grapes from the same vineyards that were supplying fruit to acclaimed wineries such as Leonetti Cellars and L’Ecole No. 41. 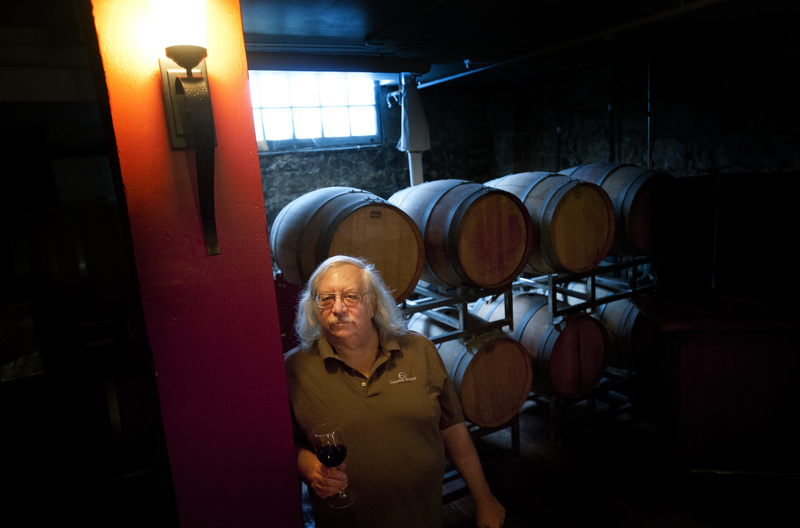 Manz, who also founded Mountain Dome Winery in Spokane, died in 2006, but the remaining partnership has endured with the same founding principle. “We feel it all starts in the vineyard. Our job is not to screw it up. If it is good fruit, the less you do to it the better off you are,” Westfall said. Grande Ronde Cellars has stayed true from the beginning, but the tasting room has had some recent changes. In addition to the wines, they now serve beer, along with some limited food offerings. They also hang artwork from local artists and have locally made blown glass. There’s live music most Fridays and the tasting room participates in Artwalk and First Friday events. Westfall, who is also a professional bridge player, has written two books with friend Sam Lange about the wineries, restaurants and other discoveries during his travels in the region. They’re working on a third book together now. We sat down with Westfall to talk about Grande Ronde then and now. SR: Grande Ronde Cellars has been around for a while now. How did Grande Ronde start and when? Westfall: The winery started in 1997, and we originally had four partners: myself, David Page, John Mueller and his brother Michael Manz. Our goal was to make wines from the Walla Walla Valley. I had relationships with two vineyards down there, Seven Hills and Pepper Bridge, and so since 1996 we’ve had the same rows (of grapes in the vineyards). They have given us some control over how to prune them and when to pick them, et cetera, working with the vineyard management. Michael died in 2006 and so since then it has just been the three of us as partners. For 16 years, we made wine at the Mountain Dome facility, although it was all our own separate equipment. After Don Townshend bought the winery, he asked us to leave, so as of this year we’re going to make wine over on Browne and Pacific at the new facility that is shared by Bridge Press and Emvy cellars. When they wanted to start in the business, John and I trained them to make wines. It will still be our equipment at their facility. We’re each individually licensed as wineries. SR: How much wine did you start out making? Westfall: The first two years we made about 200 cases. For the first two years, our merlot came from rows that were adjacent to Leonetti and the cabernet was adjacent to L’Ecole. After the third year, they actually assigned us our rows and since then we’ve had the ability to make about 1,500 cases a year depending on the year. Since we started, there have been two years that we haven’t made any wines. In 2004, the vineyard froze out and in 2011. In 2011, we got a little bit of fruit from Seven Hills but none from Pepper Bridge. In 2004, we didn’t get any grapes at all. We’ll have about 100 cases for the 2011 vintage. We don’t go out and get other grapes. Some people do, but we don’t. SR: How much wine are you making each year now? Westfall: We made about 400 cases in 2012. One of the things that I’ve been doing is selling some of the grapes to Emvy and Bridge Press and helping them develop their wine, so we’ll make the call in September how much we’ll be selling to them, but we’ll make somewhere around 400 cases of wine is probably what we’re going to be doing. We’d like to stay at that level. SR: You and John Mueller are sharing winemaking duties. What are your goals for the finished wines? Westfall: What we try to do is get a wine that will age and have some intensity. I suppose the French are our model. We typically prune the vines back so that we get about two and a quarter tons (of grapes) per acre. Some people will do as many as five tons for merlot and cabernet, but I don’t think that gives enough intensity into the grapes and balance to let it age. People don’t think that Washington merlots age, but our 2001 merlot is still doing very well. We got a 91 score from the Wine Spectator on that, and they thought it would age 15 years. The philosophy is to prune the grapes back, get the intensity into the remaining grapes and then let it hang as long as possible to get pH and acid balance … Our goal is to let the grapes speak for themselves. We’ve done it that way since the beginning. We’ve gotten seven 90-plus scores from the Wine Spectator, and it has been consistent, and we think that part of the reason is that we have a great vineyard, and we let the grapes talk; we don’t try to do too much with them. SR: The tasting room has evolved in the last few years. You’re not just offering wine tasting anymore. What will people find here? Westfall: Washington state laws and the economy have changed over the years. I think you need to change your marketing, not your product. The product, we feel, is good. Having the tasting room on Second Avenue was important because part of our goal was to let people taste the wines and make it more accessible. With that, I love art and food, so we’ve continued to develop that. Now, Washington state allows you to have a retail license as well as the manufacturing license, so we were able to expand the tasting room idea. We now host Artwalk events, and we have music most Fridays. We also have some foods, like antipasto and sandwiches. Also, by getting the separate license it allowed us to get beer as well, so we have some imported beers here now. So, if you have a group of four and two want to drink beer, you can still come here. SR: What are some examples of the beer you have available? Westfall: We have Pilsner Urquell, Guinness, Skuttlebutt Porter and Pike IPA. We always have about 10 different beers, and we have Spire Cider for gluten free. SR: Give me some more details about the food options. Westfall: We’re always doing antipasto and that varies but it will have some kinds of cheeses and salamis. We go to Cassano’s and pick up some imported Italian salamis and cheese. A lot of times we’ll put a cheese torta on it. Sometimes we’ll go to Catered for You and have them make it up for us, so it will have sundried tomatoes or pesto in it. I make a hummus and that will have olive oil and maybe a little concoction that I come up with on top. I’ve also been doing Dave’s Big Dogs, and our theory there is that the dogs always have to be bigger than the bun. And we’ll include toppings that are everything from sauerkraut to chili to relishes. I’ll also do special things for some Fridays. I’ll do lamb stew for St. Patrick’s Day. I do some kind of pasta dish or lamb or ham sandwiches … whatever I feel like. SR: Do you also host dinners? Westfall: We’ll do two or three dinners each year. Around July 14, we’ll have a storm the cellar party for Bastille Day. We’ll do a French picnic theme. We almost always do a Latin America and North American combo dinner. We usually do an Italian dinner, around Columbus Day, but we always have a Native American dish at that dinner … to keep things balanced. SR: What wines are available to buy now? Westfall: What we do with our wines is age it 16 to 20 months in oak – new oak or one vintage old oak. Then, we bottle it for four years. So, typically on a single vineyard reserve wine it will be about six years before it comes out. For the Cellar Red we change that up one year and release it in five years, so it has been in the bottle for three years. Currently, we are releasing our 2007 single vineyard wines from Pepper Bridge Cabernet Sauvignon. In June, we’re releasing our 2007 Merlot. In September, we’ll release our 2007 Seven Hills Cabernet, and for the November barrel tasting we’ll release a 2007 Charlotte’s Cuvee. We’re on the 2008 Cellar Red, and we’ll release the 2009 sometime in the fall, but we haven’t picked out a date for that yet. We have the 2008 cabernet franc is currently available, and we’ll release the 2009 next January.